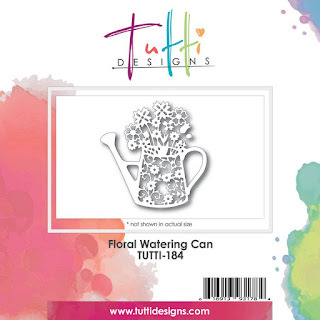 Autumn with you today to share a card created with the new Floral Watering Can die. I cut the die from dotted designer paper and layered with a variety of other paper. The die is so large and ornate that it doesn't need much accompaniment! I thought a pot of flowers needed a sweet everyday sentiment, so I added a sticker, "you can never have too much happy". How fun! 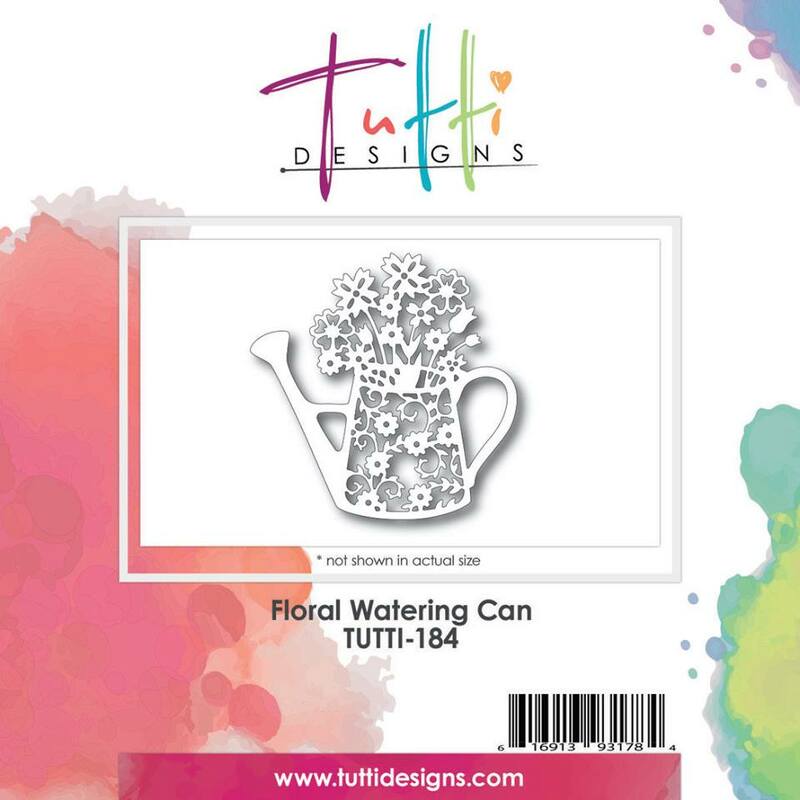 Purchase your Floral Watering Can die today! Welcome back to my Tuesday's Tutti Design posting days. I am so excited to share with you this gorgeous new October released Tutti Designs Floral Shoe. 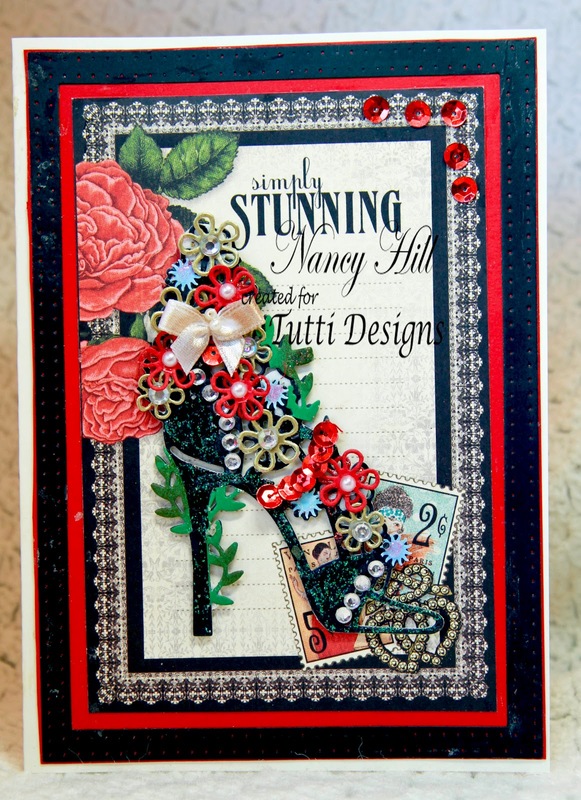 Isn't this die a STUNNING one from Tutti Designs. 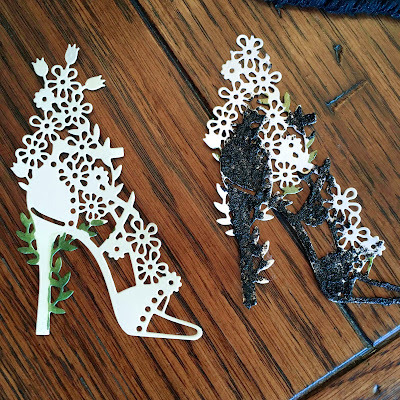 I like to embellish my die cuts at times, a little 'much'. 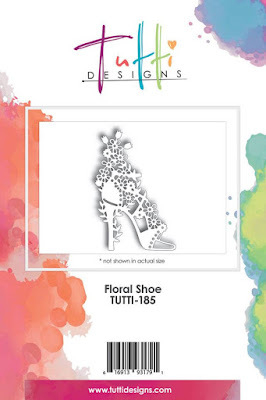 Seeing the beautiful flowers and intricate details in this die, you could leave out the extra embellishments and still have a gorgeous shoe die cut on your card. 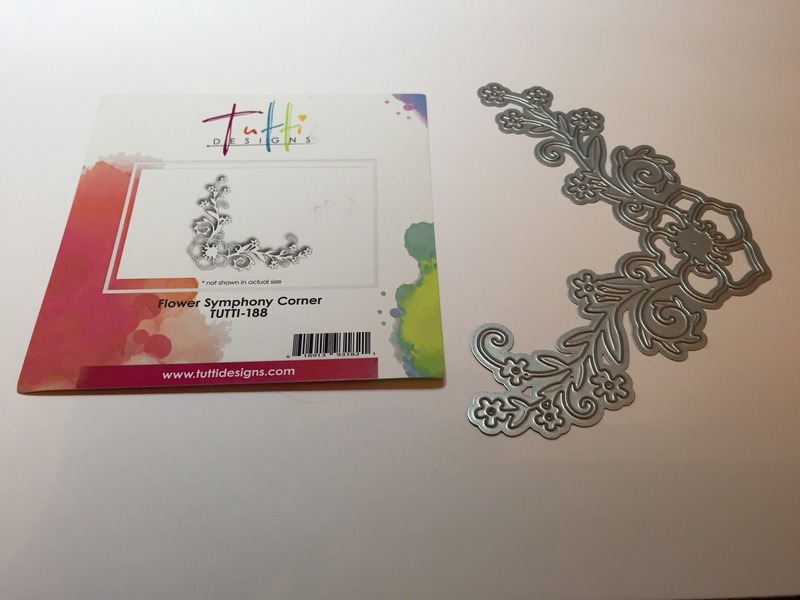 Be sure to check out Diane's sample cards using this die cut by clicking HERE to give you additional ideas on how to use this die cut. I started with two die cuts and I colored the leaves green and added black glitter to the shoe. 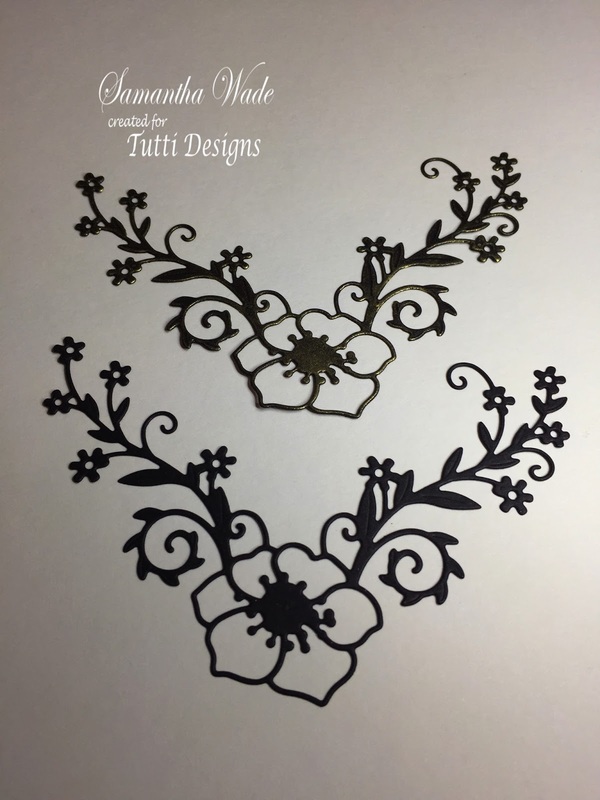 I used a Sue Wilson Design flower die cut for the flowers and glued these flowers on top of the white flowers and added 4mm flatback pearls and rhinestones to the center of the flowers. I glued the shoe to a Graphic 45 Mon Amour card stock and added a tiny bow to the shoe. This week I am sharing the Swirly Sympathy Die. It's part of the October Release. Unfortunately, we all need this type of card on occasion. Some people are able to make several of these to have in their card stash. It seems I always need one at the last minute. This lovely word die helped me put this card together very quickly. I cut the die out of blue patterned paper. I adhered it onto another patterned paper with a glue pen. I added some ribbon, a bow, and adhered it to the card base. Finally, I added some pearls to the center of the flowers. leaves lots of room to write a message on the inside. Darlene with you today and it's my turn to share a new, inspirational creation using dies from the Tutti Designs Store. 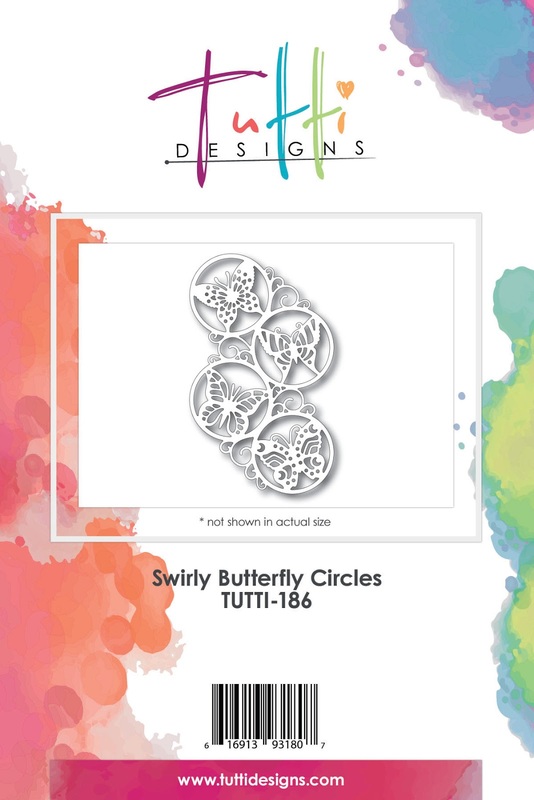 Tutti has come out with so many amazing dies recently and just wait until you see what they will have to share over the next few months! You won't want to miss it so be sure to pop in often! I decided to do a little 'paper piecing' today. A technique I don't do often but always love the outcome when I do. Here's how it all began . . . Typically when I receive my dies, I quickly die cut each one from white card stock. Not only can I see how it looks once cut, but can also then decide if I want to color it with markers ... inks ... cut again from colored papers or use it as a base as I have done today. Next I die cut the body of the die image from scrap designer paper. A few snips here and there and I was ready to 'paper piece' over my white die cut panel. 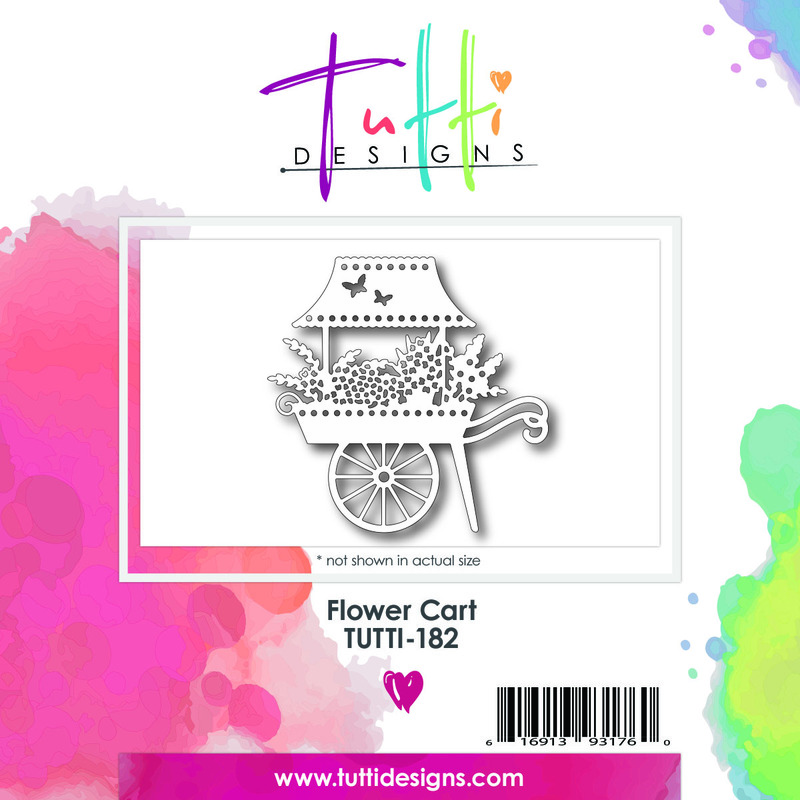 I wanted to color the handles and wheel of the cart as well as the flowers using my markers. it was time to 'showcase it'. panel and white base card. Oh and I forgot to mention ... see those adorable little butterflies? They pop out from the die cut and of course we can't waste them! then added them into the sky on my finished product! Hi crafters! Monica here sharing another Tutti Designs post featuring an October release called Tulip Panel This die is covered with beautiful tulips and plenty of vines. To create my card I used some Cosmic Flakes for the tulips and then covered the die with some Stardream Metallic card stock. I then laidd my panel over a piece of cream colored cardstock and added a metal sentiment form Making Memories entitled "Friend" a perfect finishing touch to the card. 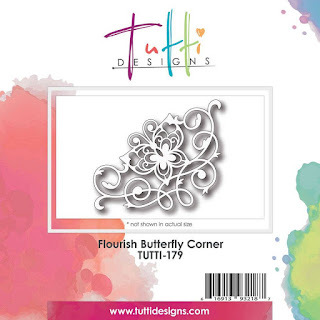 Today is Flower Symphony Corner, TUTTI-188. Die cut the corner twice from black card. Then rub gold gliding wax on both corners. 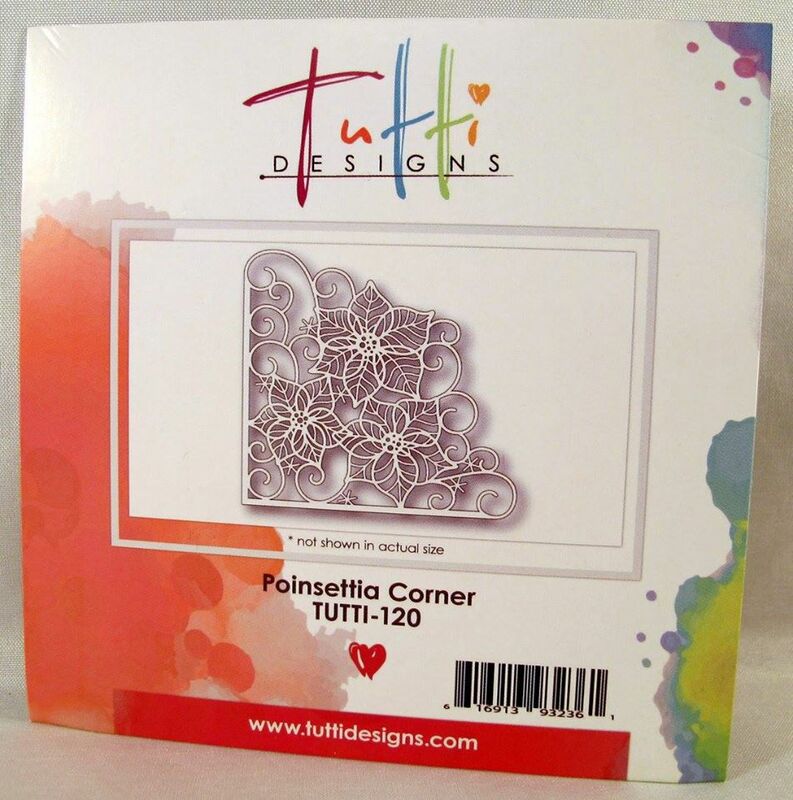 Shape the corners with a mat and ball tool to bring to life. 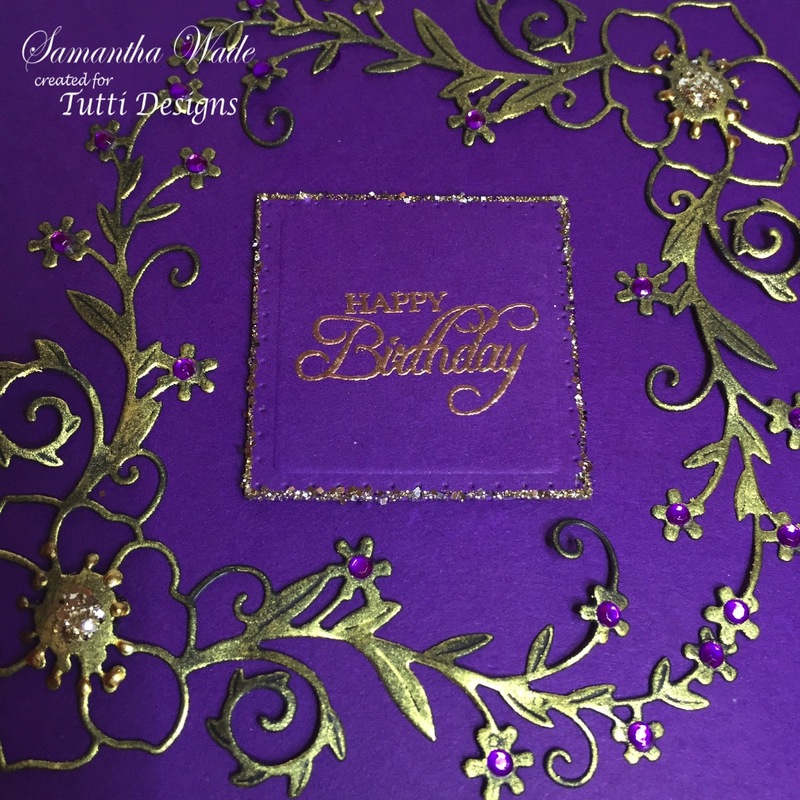 Add gold glitter and purple gems to the flowers. 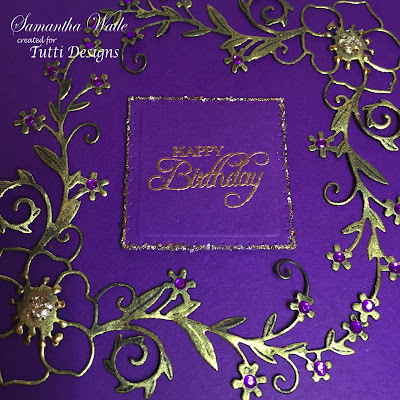 Glue onto the purple card and add a sentiment, which has been stamped and heat embossed and glittered. A simple yet elegant card. 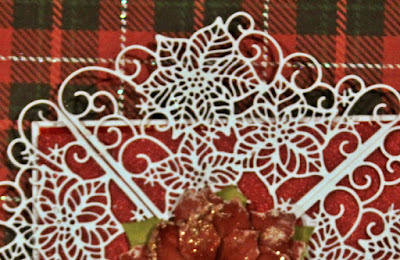 To make this card I simply cut 4 of the Poinsettia Corners and pieced them together at the center of the base of the card. I added a flower to the top of the center. for the background I used a sparkly piece of glitter paper. Their July release is available in the store and keep watching because there is MORE TO COME over the next couple of months! More new releases are on their way so keep checking back daily! Autumn here with you today to share a shabby chic floral get well card using a die from our lovely new sentiment collection. The Swirly Get Well die makes a striking focal point. 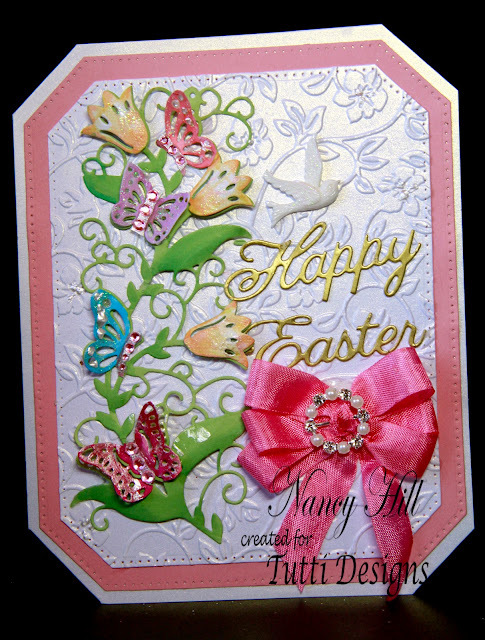 I embossed it with shabby pink, white and gold Frantage embossing powder. It was too pale for me, so I went back and sponged permanent brown ink over it. I cut an oval from chipboard and applied crackle paste to it. Then I cut the Afternoon Chat die to layer beneath my crackle panel to create a frame. Because the dies don't line up perfectly, I used several layers of foam tape to really bump the crackle panel up, which disguised the misalignment. I layered some paper flowers and a seam binding bow for embellishment and mounted layers of Prima paper with some vintage trim to form my base. I hope this cheery floral card will brighten a sick loved one's day. Purchase your Swirly Get Well die and other beautiful dies today! This the is gorgeous October new release of the Tutti Designs Butterfly Vine Border. 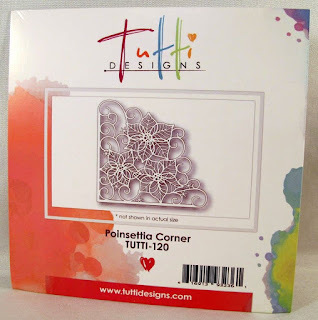 If you click HERE, you will be able to get more ideas on how Diane used this die for her cards for Tutti Designs. This would also be a beautiful die cut for birthday and get well cards. You are probably thinking of other possibilities of how you would use this gorgeous die. 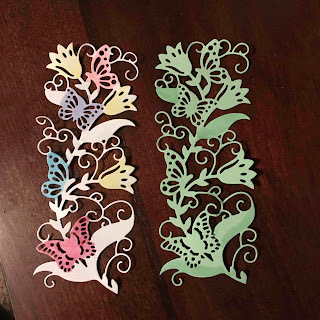 I cut out two die cuts and to cut out the butterflies and flowers on one die cut and glue the center of each butterfly on the other die cut die cut. I used Copic Markers to color the die cut and used 3D foam under the flowers to give it some dimension on this card. I added some glitter glue and rhinestones to the butterflies and some glitter to the flowers. Most of my cards have a bow. I used a rhinestone/pearl ribbon buckle slider in the middle of the bow. 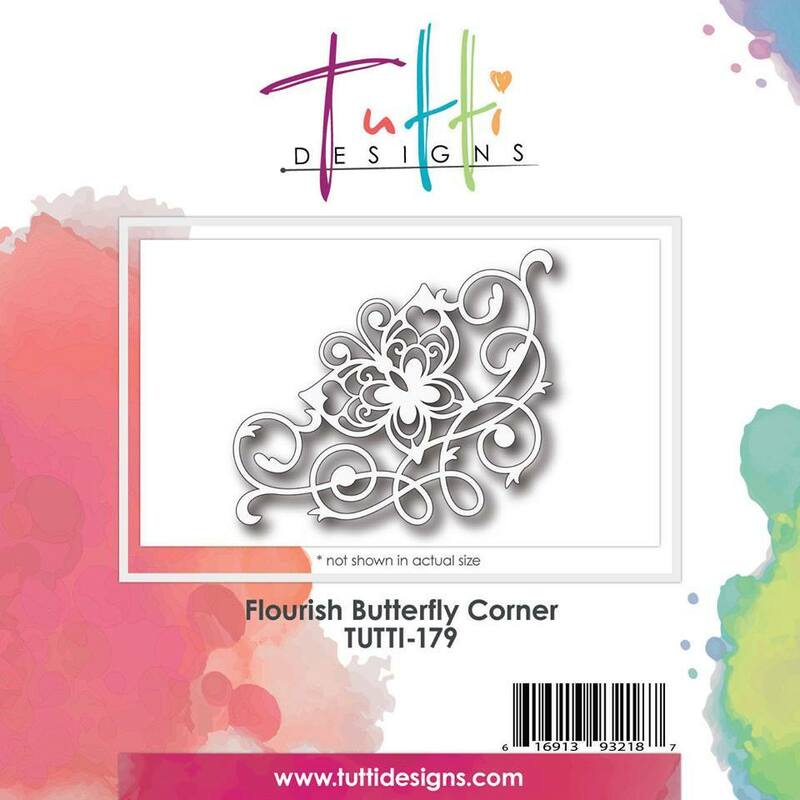 This week I've created another card with the Flourish Butterfly Corner Die. I came across this paper in my stash when I was working on another project. I thought it would be perfect for this lovely die. First, I cut the die once from a patterned paper. I adhered that cut into position on the base. Then I made another cut from a plain matching cardstock. I fussy cut only the butterfly out of the diecut piece. and adhered the second butterfly on top of the first along the fold. 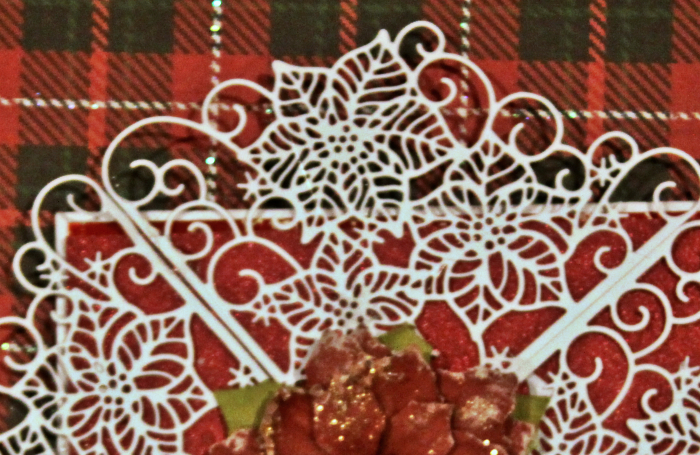 To finish the card off, I added a pretty sheer bow, and some lovely sequins. Here you can see the wonderful dimension of the second butterfly. 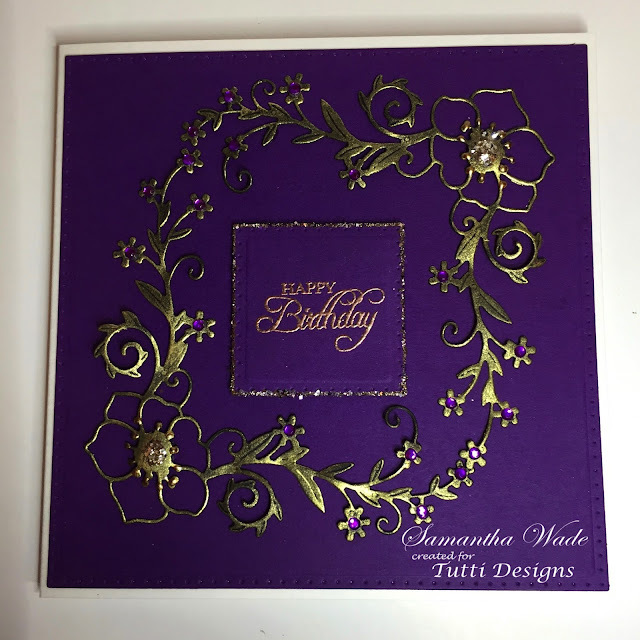 I had such fun creating this pretty card and it could be used for a variety of occasions from encouragement to birthdays! Here's a few steps I took in the creation of this card. After die cutting my Swirly Butterfly Circles from white card stock, I cut the varies butterfly sections using scraps of colored card stock I had laying on my work table. Then fussy cut them and stacked them on top of those on the white card stock die cut. Next I die cut another from pretty sparkly pink card stock, same as I used for my mat panel, and removed the butterflies for future use. It was at that point that I decided to use the pink circles behind the white circle cut for a little added dimension and texture. A pretty plaid background and a few cute little butterflies from a stamp set I've had for ages and my card is ready to go! !